Ok this isn't what I do at work. It was only during the slow periods when there was no one around. I might just make a full picture of the tiger. I'm quite pleased with the result. The pictures are doodled with pen on the back of a stack of playland ride passports at the PNE. 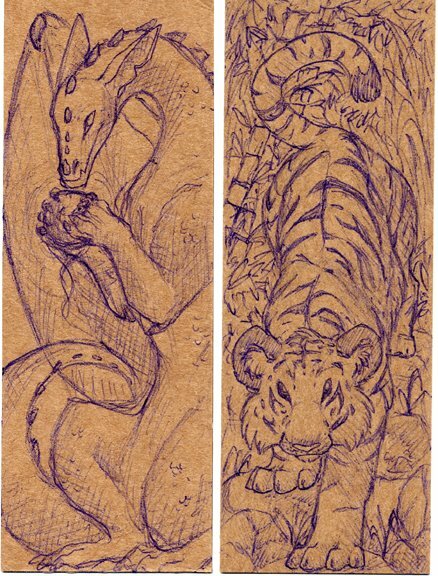 The dragon was the first one drawn then the tiger the next day. LOL. My captain saw the tiger and said it was cute. whoops. Tomorrow is my last day. I'm relief. Just like the first day. So it all comes round in a circle. Karen is going to go and see all the shows. And we're going to eat our last candy apple from the market place this year. The day after school will start and I shall have to start applying to co-op jobs. Hopefully I will get hired. Another summer has gone and another school year is starting. Time flies by so fast. It really does. time does fly by. i mean half of us are graduating.... aaaaah!